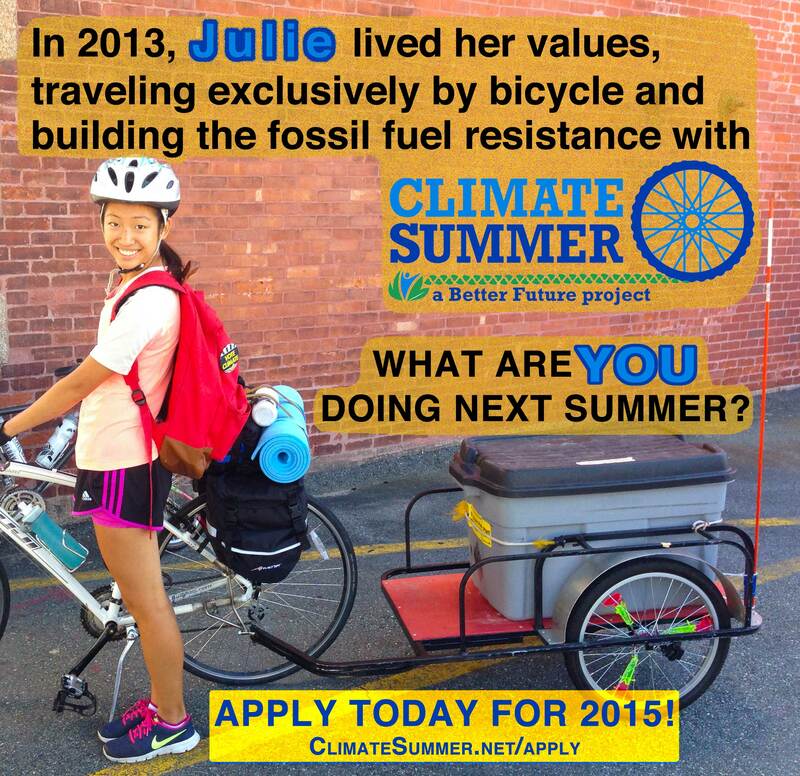 As we look towards Climate Summer 2016, we wanted to highlight a few of the posts from the 2014 cohort to give applicants a feel for the program. I’ve chosen a handful of my favorite posts from last summer (one from each team), but you should dive into the blog yourself if you want to get a bigger picture. In each post, you can click on the author’s name to see a photo and short bio, and you can also click on the team name in the byline to view the team page. If you want to trace the posts from a particular 2014 team, see the note at the bottom of this post. Enjoy! Team West Mass with Pastor Aida: (L to R) A. Grace, Dineen, Ben L., Aida, Georgette, Ben W., and Stephen in the top right! Ariel holding the flag and canvassing at the fireworks. 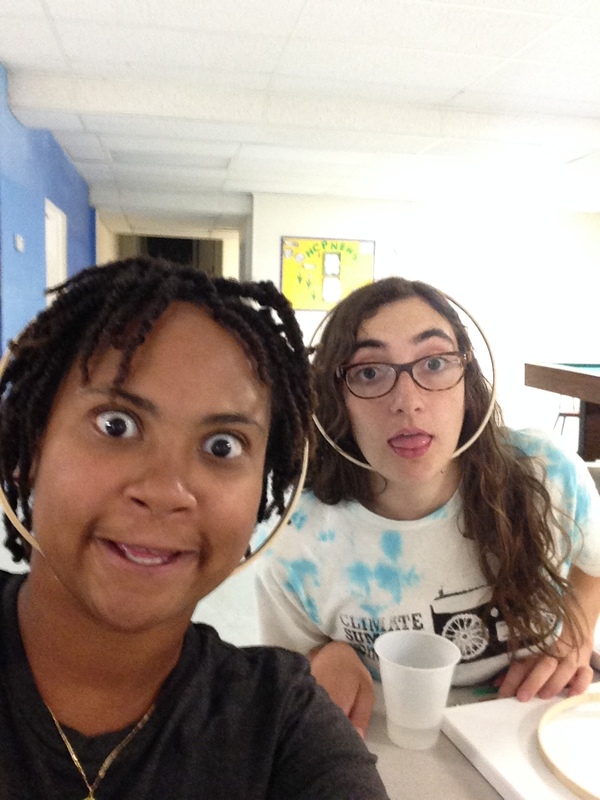 Kay (Left) with teammate Alissa in a lighter and craftier moment of the summer! Click a 2014 team name below to view posts from just that team. If you want to follow a team’s journey from start to finish, remember that the posts you see first are the most recent. (If you read in the order they appear on-screen, you’ll be reading from the end of the summer to the beginning). 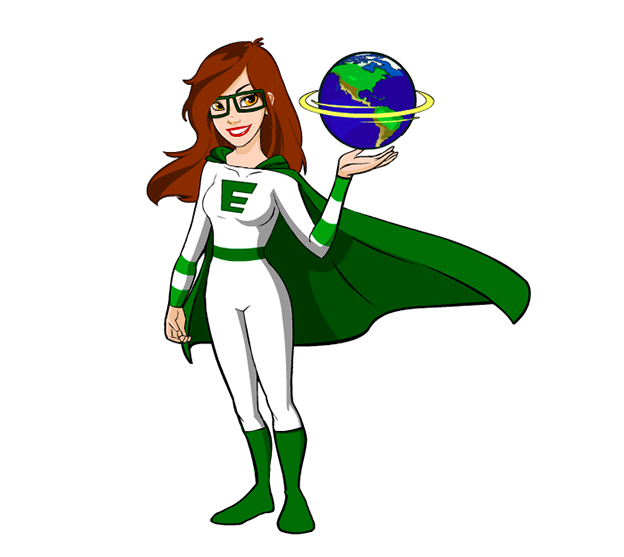 My alter-ego Climate Girl, who can shoot lasers out of her eyes that destroy excess greenhouse gases in the atmosphere. Before Climate Summer, I felt overwhelmed about climate change because I wanted to solve this dire issue immediately. I wanted to be a climate ‘superhero’ who swoops in to save the world from climate chaos in the nick of time. Even though the rational part of me knew that this was an unrealistic, unattainable goal, deep down I wanted this because I wanted a sustainable world so badly. To use the cliché, I was carrying the weight of the world on my shoulders without a clear path of how I was going to save the world. One of the many valuable lessons I have learned this summer is that I do not have to save the world; in fact, I cannot save the world from climate change. Despite how obvious this may sound, it took me a while to accept this fact. I can envision a sustainable, just world so clearly that it was hard for me to accept that I cannot make it happen. An equally important lesson that I have learned is that it is lots of people working together who change the world by bringing change to their communities. Since the world is so interconnected, one difference does impact the world. If one only looks at the big picture, it is easy to feel overwhelmed. If one narrows in, however, we realize that global problems are present in our own communities. 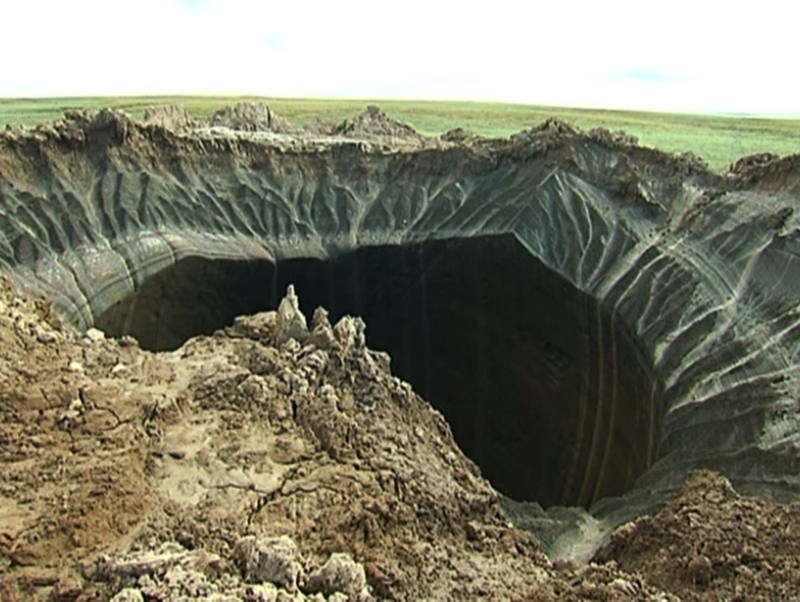 I’m terrified about the crater that was recently found in Siberia that might have been caused by a methane explosion due to melting permafrost. What’s even worse, I can’t put the methane that was released back into the ground. I can, however, help Massachusetts communities stop a natural gas pipeline expansion that would cause even more methane to escape into the atmosphere, further exacerbating global warming. I try to remind myself that I can only do my part. If everyone across the world tackled every new fossil fuel infrastructure expansion, we could actually mitigate climate change. It has been wonderful working with passionate people this summer trying to stop the Kinder Morgan pipeline. 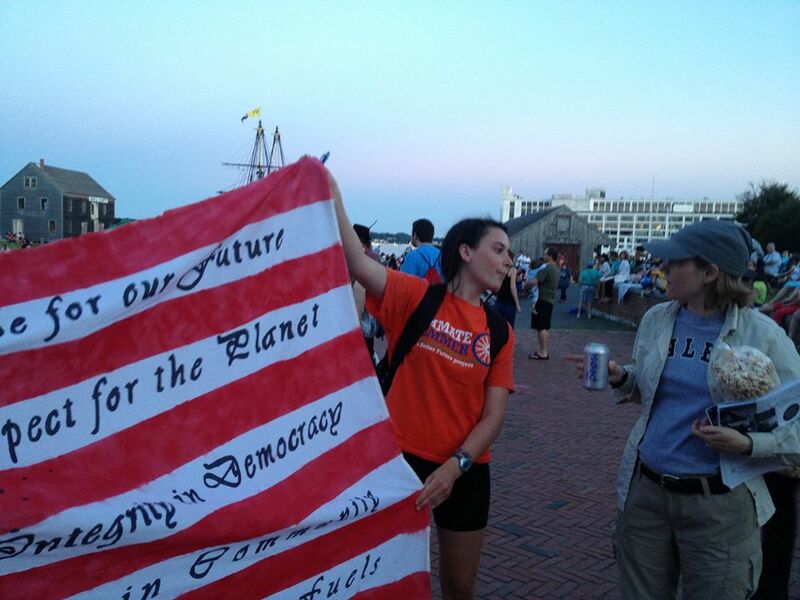 The people we have met across Massachusetts are saving the world even if they do not know it. Trying to stop this new natural gas pipeline is one of the pieces of the puzzle of saving the world from the worst of climate change. When I do this work, I remind myself of this quote, “Whoever saves one life saves the world entire” because it is everyone making small differences that will save the world. Team North Shore only has five jokes. That’s one of them- saying that we only have five jokes. We repeat jokes that aren’t particularly funny over and over again until we form a sort of shared language and history through repetition. For example- I once said that I’m not very good at keeping in touch with people, that I don’t really care what my friends eat for breakfast. Now, anytime long-distance friendship or any sort of companionship comes up, someone will invariably mention that I won’t even care what you ate for breakfast. It’s not funny. It wasn’t funny the first time, and it doesn’t get any funnier each subsequent time it is shared, but nevertheless, we continue to repeat the same jokes over and over again. (Did you know Abbie was in a movie on Netflix?) What the jokes do is begin to form a culture around the language. Our team started off a little rocky, as we struggled to figure out our group dynamic. We all came to this work with very different experiences and expectation. For a while, we weren’t so much a team as a group of people who were working and living together. We cooked together, ate together, read together, but when we weren’t yet a cohesive unit. Ultimately, this made it very difficult for us to be the most effective we could be as we didn’t yet have strong relationships to work off of. A few weeks ago, when walking back from the laundromat, Shreya and I had a moment of despair. We had just read Ben Weilerstein’s blog post I Like my Team, and were frankly feeling a little bitter. I told her I didn’t know if we would keep in contact afterwards, and that we’d have to be okay with that. We were resigned to a life of general friendliness, without any real cohesion. 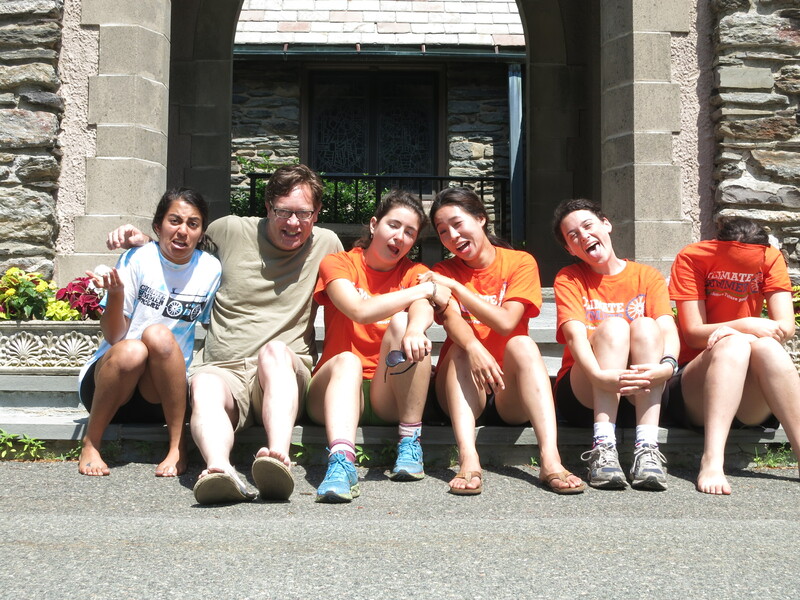 The team joking around with Father Clyde of St. Andrews Church in Marblehead. 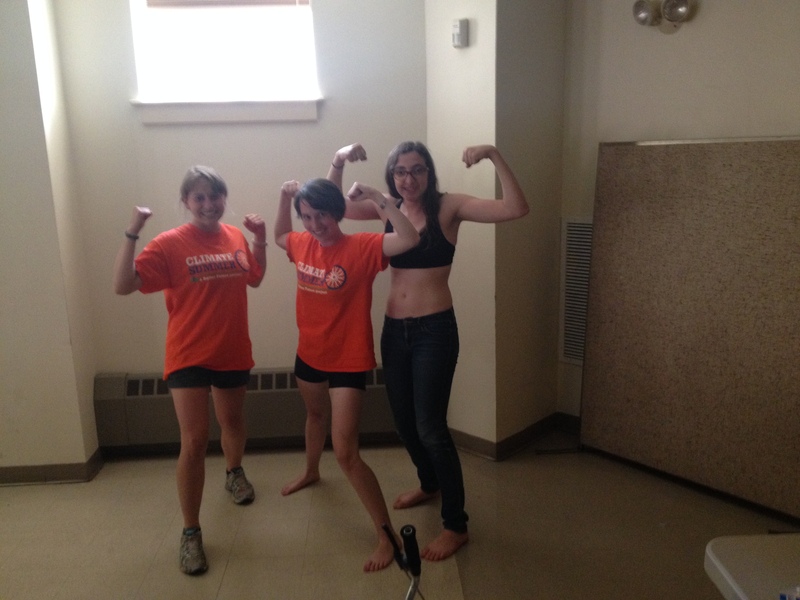 Somehow, in the weeks following that walk, our team has come together, and I think part of it is because of the jokes. We began to have a shared history around which we have begun to build a culture and language. When we say the same things over and over again (did you know that I have a family friend in Gloucester?) we create a more cohesive unit. We probably aren’t the funniest team or the loudest team or the most creative team, but we have 5 jokes. Building relationships is about much more than repeating the same silly phrases over and over again, but it’s been really exciting to watch as our language has evolved as the group has become more of an entity. Only now that we have begun to move as a team are we able to do our best work. Perhaps what I’ve learned most this summer is that organizing is slow. Building relationships takes time; figuring out how to work with people takes time. It’s really hard to reconcile the slowness of what is at the heart of organizing with the urgency of climate change. There is this constant battle between efficiency and true deep connection. We form meaning out of shared history, shared language, and that process can take years to build. I don’t think I have any answers to this conflict, but now I think I have a much deeper understanding of some of the root difficulties associated with organizing. Posted on behalf of Kay Young, Team Leader, Team For the MASSes. Members of the 350 MA Metro West node and Climate Summer reflect on how to craft effective stories. became clear that that notion is just marketing. Natural gas is a bridge to nowhere. This summer, I was tasked with shattering the pristine image of natural gas not singularly by raising awareness about the scientific evidence but also by collecting stories as we traveled from city to town. These stories illuminate the reality of the implications that fossil fuels continue to bear on communities across America and the planet. To be honest, asking a person to be interviewed is nerve-wracking — not because I’m shy, not because I’m intimidated (OK, maybe a little), but because I’m asking someone to divulge his or her intimate thoughts about complex issues that either immediately threaten his or her health or weigh upon his or her psyche in a major way. Despite my hesitations — at rallies, at film screenings, and at coffee hours — I asked people to trust me with deep parts of themselves. The result was stunning. From so many perspectives, a multifaceted picture of the fossil fuel resistance was painted. The people engaged in addressing climate change fight for progress for so many different reasons. Unfortunately, the full spectrum of perspectives and identities espoused in the Movement are not presented in the main narrative when environmental issues are aired on major platforms. 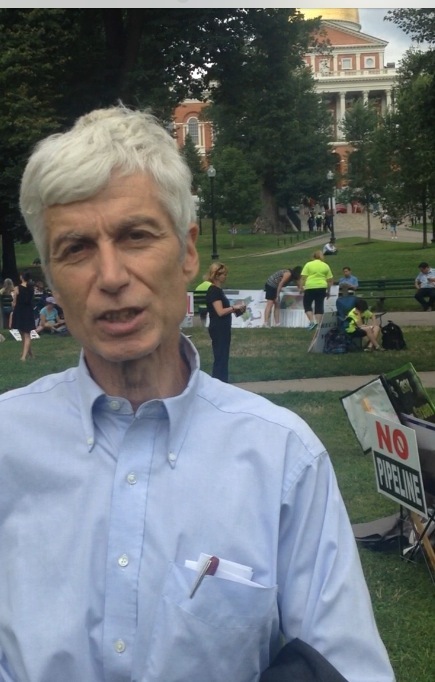 Mike from Boston Climate Action Network telling Climate Summer the urgency with which we need to act on climate change at the Boston Rally against the Kinder Morgan proposed pipeline. opportunity to deepen our perspective. We need to engage people from communities of different socioeconomic statuses, size, and ethnicity so that together we can build a better future with each other, not for one another. I was born on August 3rd 1994. Coincidently, my little brother was born on August 3rd, 1996. So ever since I was two years old, I’ve shared my birthday with my little brother. This summer was different though. This summer was going to be the first summer that I was going to be able to celebrate my birthday all by my lonesome and bask in the glory of my own birthday. As luck would have it, out of my four other teammates and the other 364 days that you can have a birthday, my teammate Rachel also was born on August 3rd; so much for my own birthday eh? 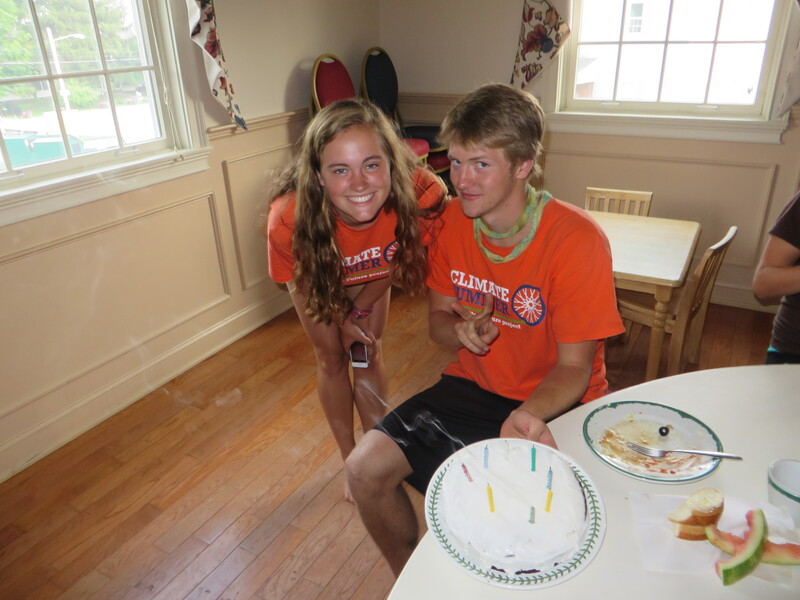 Rachel and I with our second birthday cake in Townsend! While my birthday this year wasn’t new in that sense, it was still made special in many ways. On August 2nd, we were in Winchendon. We had a busy day, had a travel day in the following morning and more work to be done that night. We went up to M.J. Galat’s house to use the internet (because her family’s gorgeous cabin didn’t) and there was a surprise. She ended up making Rachel and I a vegan birthday cake (vegan so Zalo could enjoy its deliciousness as well)!!! That was birthday cake #1. Then the next morning, she made us vegan AND gluten free pancakes (for Tuula) as well. Not going to lie, Rachel and I also ended up having some of the birthday cake for breakfast that day – please don’t tell my mom. Departing that day, the day of my birthday, I gave her one of my biggest hugs because like many others this summer, I felt like I had yet another mom. 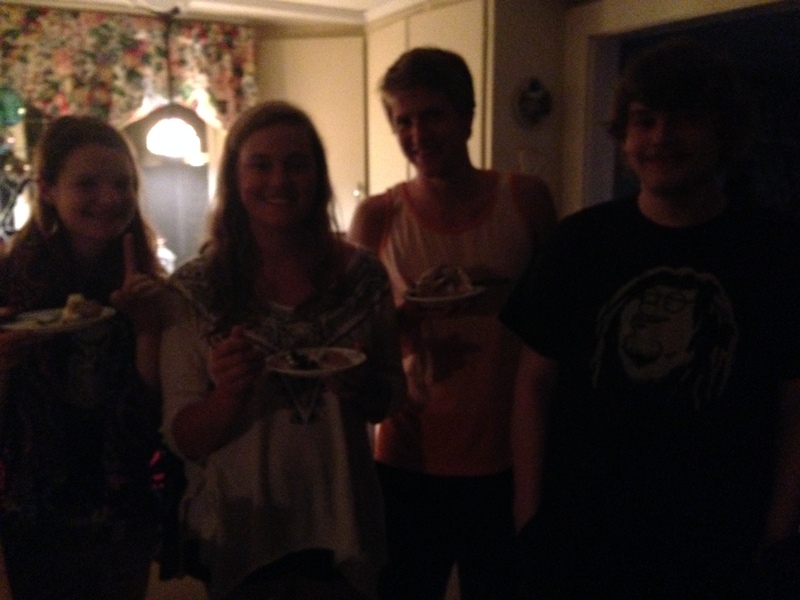 Jana, Rachel, Me and Zach celebrating our birthdays with ice-cream cake! 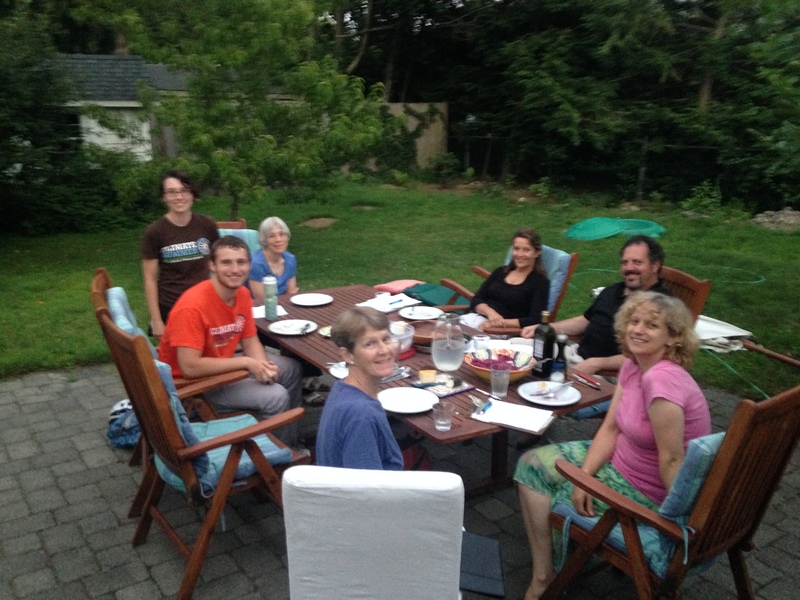 Then yesterday, on the 8th, we went to Bob and Julie Jette’s house for – you guessed it – yet another birthday dinner. What made this one a little more special was that we started our summer in Dracut so it felt like coming home but also because their son, Zach, had his birthday on the third as well and our other teammate, Jana, has her birthday on the 10th (so really half the people there were celebrating their birthday). That is when we had the best potatoes on this side of the Mississippi and a home-made ice cream cake that was so good, I had to lay down after eating too much to make sure I didn’t taste it a second time on our bike ride back. Many hugs were exchanged that evening (I made sure not to hug too hard for obvious reasons). I can’t thank these ladies and their wonderful families enough for what they did to help make Rachel’s and my birthday one for the books. We didn’t get any presents or get to spend it with our families but instead we extended our existing families and received something you can’t wrap in a box or put a bow on. We received the love that made us feel like we were their own kids during a time when we couldn’t be with our own families and we can’t thank them enough for what they did. I truly will never forget my 20th birthday and the three moms and families that we celebrated it with. Posted on behalf of Luke Sherman, Public Narrative Coordinator, Team For the MASSes. 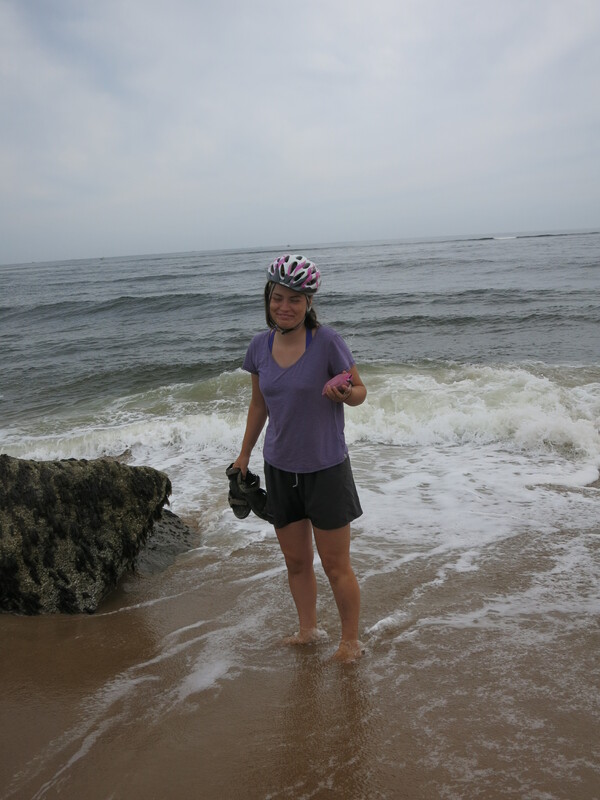 As Climate Summer 2014 comes to a close, I’ve begun to reflect on my experience of the past two and a half months. Specifically, I’ve wondered which lessons from this summer I will take with me after this program ends. In a way, such reflection assuages my feelings of sadness and bitter-sweetness that my time as a Better Future Project intern is ending. It allows me to feel as though my experience isn’t ending the moment August 16 rolls around. Instead, it will continue with me, long after I put my bike in my dusty garage and unpack my Climate Summer shirts, mess kit, and sleeping bag. One thing I will certainly take with me is the value of minimalism. For the past ten weeks or so, my fellow riders and I have been living in conditions that most Americans would find difficult. We all slept in the upstairs of Kathy’s unfinished house! asked me after I described to her some of the peculiarities of Climate Summer. “It’s not a big deal,” I said offhandedly, doing my best to conceal my own anxieties regarding my future abdication of luxuries that most of us in our society take for granted – regular access to showers, for instance. 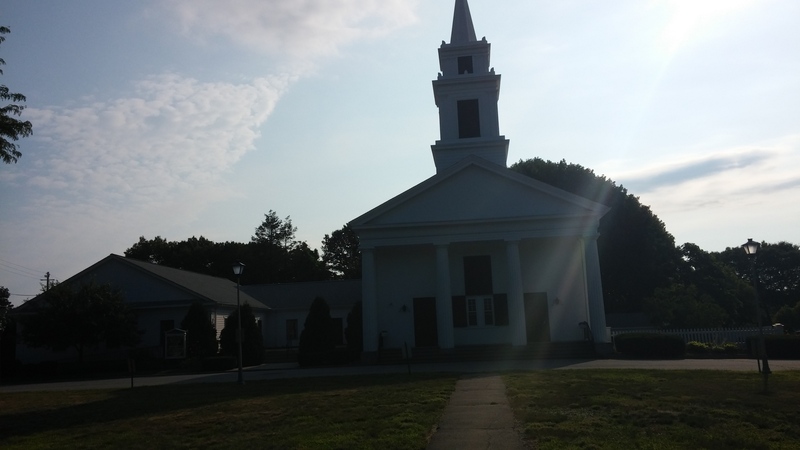 The church in Slatersville, Rhode Island. showers and a laundry machine and dryer to us (I’m looking at you, John Flaherty of Slatersville Congregational Church! ), we appreciate the feeling of cleanliness so much more. Paradoxically, the less I seem to have, the happier I seem to become. The value of minimalism is a lesson I definitely hope – and expect – to take with me after I depart home. Knowing that this program will continue to impact my life, in more ways than one, comforts me in the face of the recognition that I will soon cease biking around New England, traveling to communities to fight fossil fuel infrastructure projects. When I asked the incomparably visionary Henry Allen ‘why Gloucester’ I was expecting the usual answers: vibrant culture, peaceful community, beautiful ocean, but instead he said he visited years ago and before he got off the train he knew he was home. It took him years to return, but he’s now a pillar of the community (which is indeed vibrant, peaceful and beautiful) and brings people of all ages together into important dialogs through political, folklore and Youth Theater. 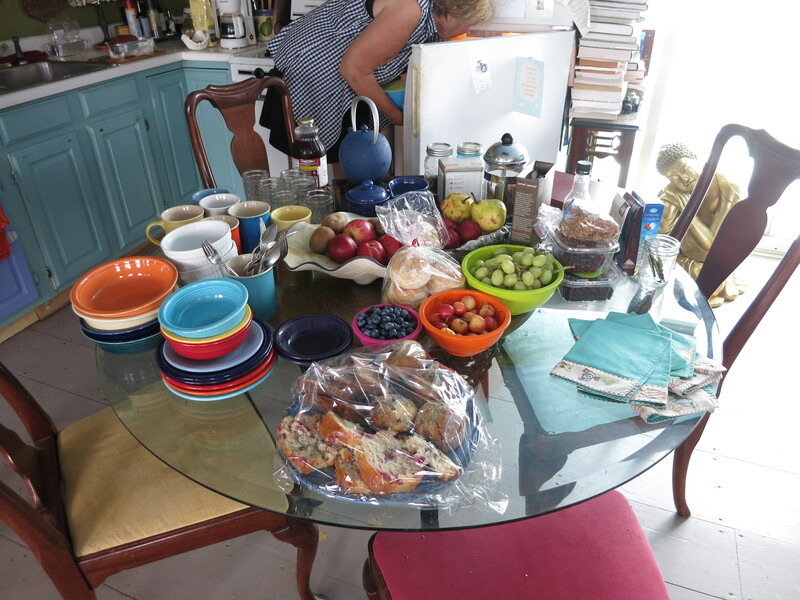 A beautiful brunch spread at Shari’s lovely cottage. When I met Shari at a public narrative training and asked her to tell her story, she smiled and without hesitation shared of how this “funky little cottage” in Newburyport, MA popped up in her email and she knew it was hers immediately. She visited, bought it on the spot and has since been dedicated to sharing the beauty of the great marsh with a generation of students and together they are working to protect and honor it in any way they can. At dinner in Marblehead, Reverend Clyde discussed why he was drawn to faith and spiritual work. He said he’d had an experience that shook him and he wanted to do what he could to make change. He saw religious groups as strong, committed communities able to organize and work to alleviate suffering. He grapples with faith and grapples with the role of a faith community—their responsibility to set a moral standard and remain engaged with their values and how those values relate to religion in this day and age. The beach is as good a place as any to listen for your calling. I’ve been thinking about calling. I’ve been thinking about this idea of connection to place one place you can be where you will feel fulfilled and whole while contributing to growth and change. I don’t think I believe in something like “fate” or “destiny”, that we have one place or one role or anything particularly static to offer, but what I’ve found in talking to communities this summer is that sometimes people know, in ways that can’t be understood with logic or reason, how it is they can engage their skills to enact positive change and are drawn to the places they’ll be most able to do that. Which is not to say this is a passive process. Shari spent a lot of time seeking out organizations to volunteer with and Henry spent years just observing the community figuring out what they loved, the ways they were strong, and what they still needed, where the gaps were. Maybe it’s not “calling” exactly, but from what I’ve seen it is a very strong commitment to show up and to listen. Because there is still this question of ‘where do we start! ?’ These issues are huge and there are so, so many of them, but for many of us in Massachusetts (especially at elite colleges), we are not really the ones climate change will affect first or in the worst ways. So how do we help in ways that are genuine, honest and effective? It’s something I’m definitely not done grappling with (nor do I anticipate I ever will be) but it’s been really inspiring to watch our community partners this summer. Each of the three I named and so many others have found communities that they feel a deep, strong connection to and then have spent a long time listening to those communities and supporting them through specific skills and empowerment. I don’t think I’ve found my calling. I know I must be engaged in climate justice work, but I’m still figuring out what that means for me. What I do know is that it will take time and patience and unrelenting commitment to connection. For now I will continue listening and strive to be open to the unexpected. 7:30 – Wake up and help make breakfast, typically oatmeal or scrambled eggs. Over breakfast we’ll talk about what we’re doing that day and what has to get done. Whoever didn’t make breakfast then does the dishes. 9:00 – Go find some Internet. 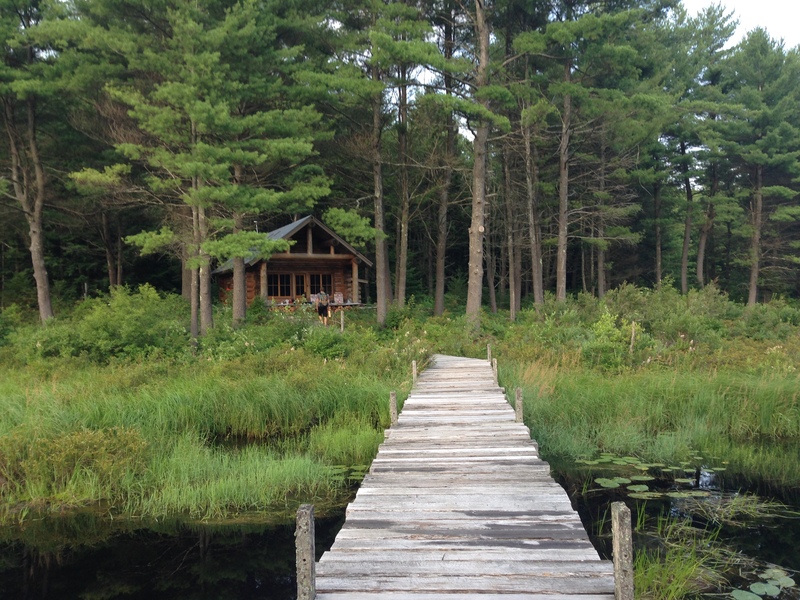 While staying in Winchendon, we got to stay in a log cabin on the woods of MJ Galat’s property. It was such a beautiful spot and so relaxing but there was no wifi. So we would walk up to MJ’s home and hog some of hers for a little while. 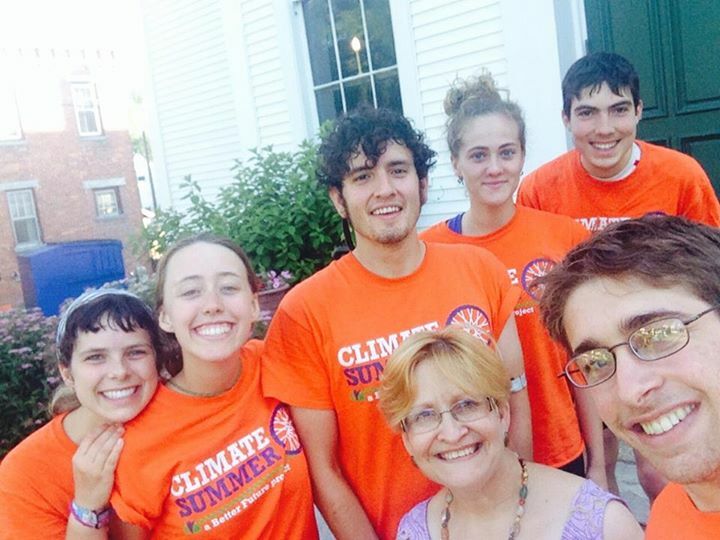 There’s a lot of office work we have to do for Climate Summer such as checking emails, making calls, writing community reports, updating contact lists, and planning for events. For me, a lot of this involves writing press releases and media advisories, which I then send out, and call reporters about. Meanwhile, Nicholas, our social media coordinator, will be posting the latest blog or making a meme to post on our social media platforms. Jana, our community outreach coordinator, will be checking emails and making sure housing is all set for our next town and Tuula, our team leader, will be working to check on plans for today and the next day. Zalo, our video coordinator, will be working on his computer to edit the latest video. We’ll then all work together to plan our final event. Our Movement Building Workshop in Lowell has been a lot of work to plan but we’re feeling confident as it comes up this Sunday thanks to all the hard work we have put into it. 11:00 – Lunch prep. Since we buy all of our food from scratch to save money, a lot of time is spent cooking. We have to evenly distribute the chores so not everyone is cooking all the time. For lunch we’ll have some cut up veggies, apples or peaches, rice, and lentils. You can’t ever go wrong with lentils. 12:00 – Lunch time! We put away our computers, go back to the cabin, and eat our delicious food on the porch. We’ll talk about what still needs to get done and often start getting silly after having been so busy for the past few hours. 1:00 – We try to make sure to get some down time every day and after lunch is usually a good time. Activities vary from just hanging out to napping to going on a hike. 2:00 – We get on our bikes and head out to visit a local farm. We always have to account for travel time, as it takes a little longer to get places on your bike, so we usually allot 30 minutes. Today, we visit Noonday farm, a farm that donates all of its produce to local food banks. I love getting to visit these farms and hear from the unique people who run them. We’ve visited a lot of farms this summer, mostly because we all love what they do, but also because they are the model of living sustainably. Getting to see the way they live is a reminder to us that living off the land can done. 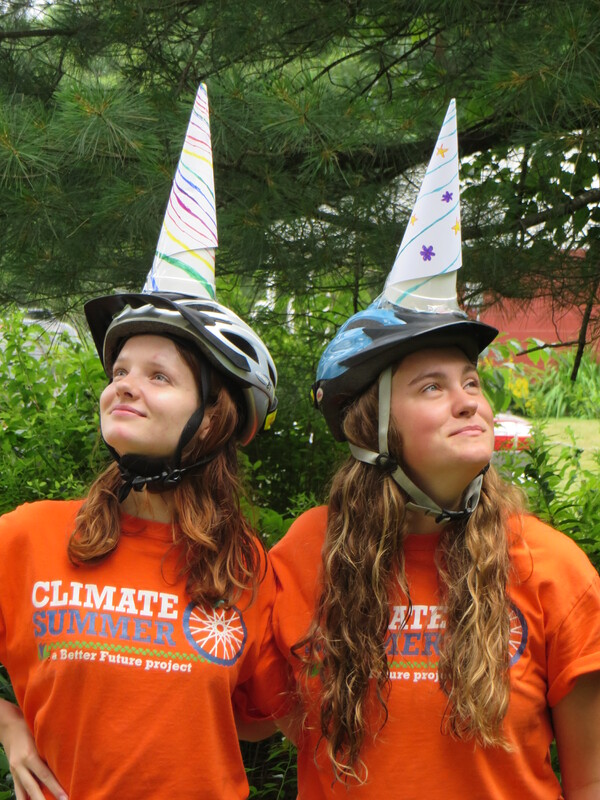 5:30 – We help serve at the Community Dinner at the Unitarian Universalist Church and someone asks, “are you the climate riders?” making us feel much more important than we are. While we have not stayed at any of these churches, we have enjoyed helping with their weekly dinners. They’re a great way to meet people and give back to the community who has been so generous towards us. And then, we get to eat with them, and the food is always amazing. 7:00 – We give a presentation to the community about our program, the pipeline, and what they can do to help. We have this presentation down to a science. This day, our audience was many from the dinner as well as our host family and a few other people involved in the pipeline fight. Our audience varies a lot so we have to make sure that our “ask” for how they can help is something the feel comfortable doing. 8:30 – We bike on back home, chugging through those hills so we can be back sooner. 9:00 – Our hosts show us how awesome they are. The next day was Nicholas’ birthday and mine and so MJ made us a delicious, vegan birthday cake that night. After eating, we hang because trying to do work after 9 just never works out. At MJ’s, they had a fire pit outside, so a few times we all sat around together roasting marshmallows and getting to know each other. She has one daughter, Casey, who is going into her first year at UMass Amherst and twins, Marissa and Matthew, who are in high school. Getting to talk to some younger folks was a fun change for us. I hope this gives an accurate depiction of what it’s like to do Climate Summer. It is definitely a lot of work and we have to force ourselves to take breaks sometimes, but every day is so rewarding. I’ve learned so much by getting to see into other people’s daily lives and work so closely with a great group of people. Thank you to all our hosts and to everyone who has showed let us peek into what their life is like. You have all inspired us more than you realize and we plan to continue to spread your stories as we go back to our lives away from Climate Summer. Posted on behalf of Myra Sampson, Media Coordinator, Team For the MASSes. We are all getting stronger in so many ways everyday. us, or it’s something sharp that stops us right in our path and demands immediate attention. Both kinds of stops are unavoidable. The first kind allows us to keep going, and the second makes us stronger. Hallie, Alissa, and I taking a much needed break at the top of a hill. hadn’t been paying attention and I biked myself into a particularly large pothole and found myself struggling to get out. Then there have been times where I have found myself stuck in an emotional rut, but each time I have found my way out. As a team, we have made it through illness, injuries, and disputes, and each obstacle in our path has made us better and has prepared us to handle the next. There is no way anyone could do this alone; teammates are essential to the the Climate Summer riders’ survival. My teammates are incredible, and each individual brings something different to the team. Hallie’s positivity is contagious; she is always singing “Everything is Awesome,” an uplifting song from the Lego Movie. As you go up a hill, pulling a trailer, you can always hear Hallie singing “Just Keep Pedaling,” a Climate Summer adaptation to “Just Keep Swimming” from Finding Nemo. Kay is always ready with a hug or encouraging word when you need it. Alissa keeps me updated with the latest political news and Luke always has a joke at hand to lighten the mood. My amazing and supportive teammates. This summer, we have all grown in so many ways. One of the things I have learned is that I can’t do everything by myself and that my teammates have made it possible for me to succeed. Posted on behalf of Hallie Kenyon, Social Media Coordinator, Team For the MASSEs. 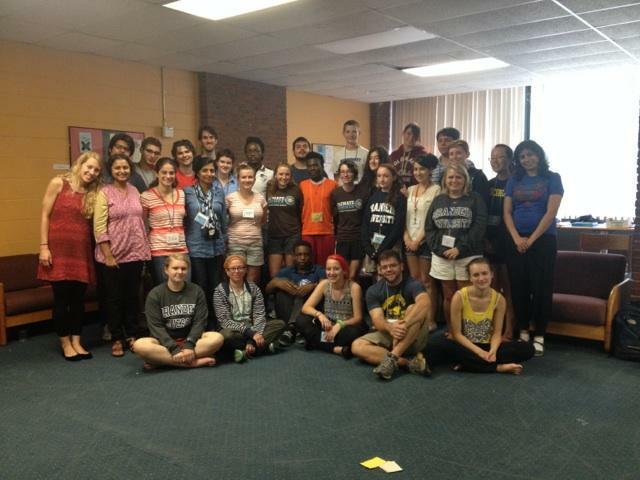 On Tuesday, August 5, 2014, I had the opportunity to speak at the Interfaith Youth Initiative at Brandeis University. People of almost every faith came together for this program. There were people who practiced Judaism, Islam, Hinduism, Buddhism, Christianity, Humanism, and a lot more, which made this experience for me all the more interesting. Team For the MASSes with the Interfaith Youth Initiative at Brandeis University. friend! When we went to lunch with the group, Myra and I had incredible discussions on our projects, about ourselves, about our religions, and about so much more! 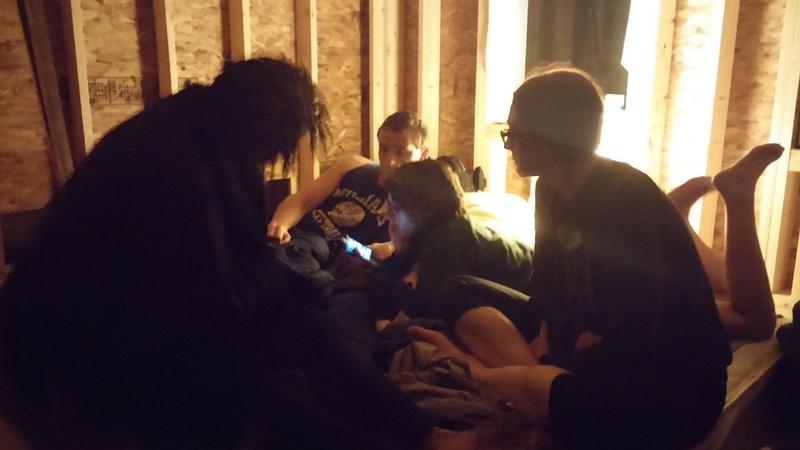 The group ranged from ages 15 to 22, and I felt as though I was able to connect with all of them. 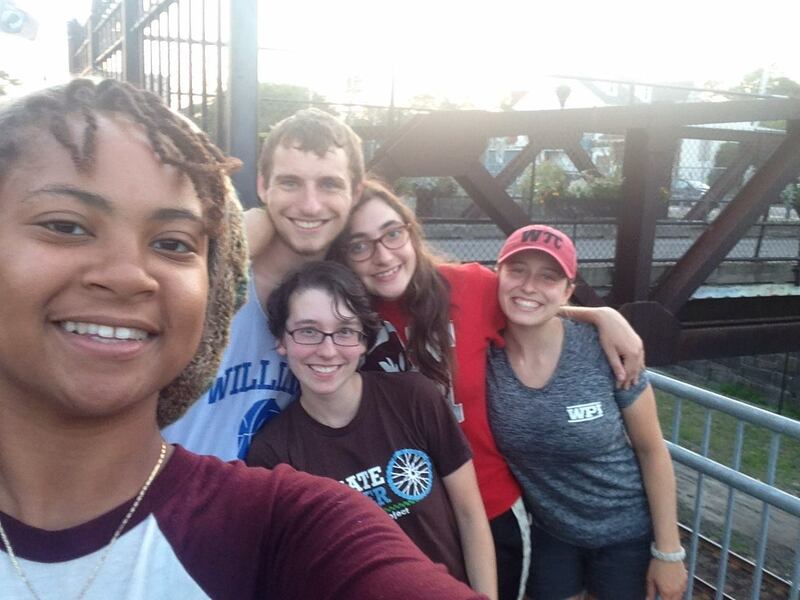 As an active member of the Jewish faith, I felt I could truly connect with everyone in the interfaith program. I was able to express the values that I was taught by my rabbis, cantors, and religious teachers and how they related to the work that I have been doing all summer. One value in particular that I discussed and that has always stuck out to me is Tikun Olam, meaning “heal the world.” When I was first taught this message, it was very simplified and all I could comprehend of this value was to plant trees. Since then, I have discovered it has many meanings, and every meaning is just as beautiful, justified, and impactful. It’s hard to imagine one person healing the world, but if all of us do just one thing to heal the world, we are all moving in the right direction and getting closer to the world we all envision. The work that I’m doing this summer has allowed me to truly reflect on how faith, communities, and people power can be mobilized in order to accomplish our goal of creating a better future. We are ALL trying to leave a legacy, whether it is for our families, friends, neighbors, or even ourselves. The students whom I worked with had a mission for bringing peace to our earth and our world. I couldn’t have agreed more with their mission and their messaging; in fact, I felt a deeper connection to the work I have been doing all summer just from talking with this group and understanding that we all come from different places yet we all have one goal in mind — peace. 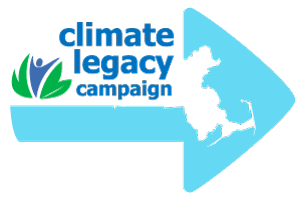 Join the Climate Legacy campaign and help build a better future. needs. By leaving fossil fuels in the dust, we are eliminating social unrest caused from dependence on oil and other fossil fuels as well as eliminating unrest due to issues that stem from climate change, such as droughts. It may be hard to imagine, but the drastic climatic changes that we have caused cause droughts, which lead to loss of crops, water, goods, and economic losses. Those losses can affect some countries so much that wars and social unrest are an outcome of this unfortunate human-caused event. On the brighter side, WE can stop this from happening. Bringing together people of different faiths, communities, backgrounds, beliefs, political backgrounds, etc. can really make a difference in our world. By eliminating stereotypes, oppressive behaviors, and becoming more understanding and open to different ideas and cultures, we are able to move forward with our thinking and with our solutions to the problem of climate change.